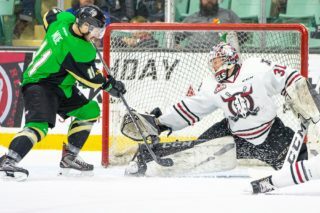 PRINCE ALBERT — In order to post what would be a major WHL post-season upset, the Red Deer Rebels have no choice but to simply be first to the puck versus the Prince Albert Raiders. 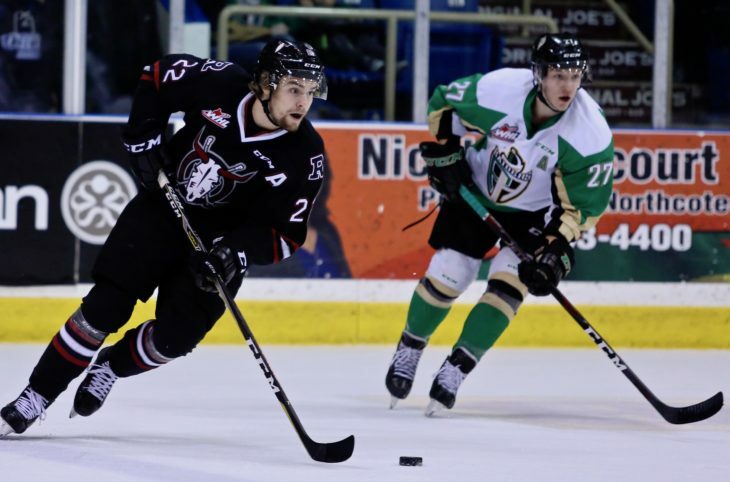 That wasn’t the case Friday and the end result was predictable — a 3-0 win by the Raiders in the opening game of a best-of-seven Eastern Conference quarter-final at the Art Hauser Centre. 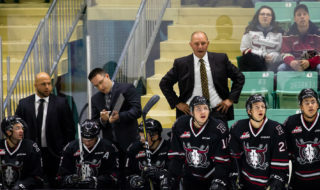 “I thought we had jump but we just didn’t win enough battles tonight,” said Rebels GM/head coach Brent Sutter. “We need to be better in some areas. 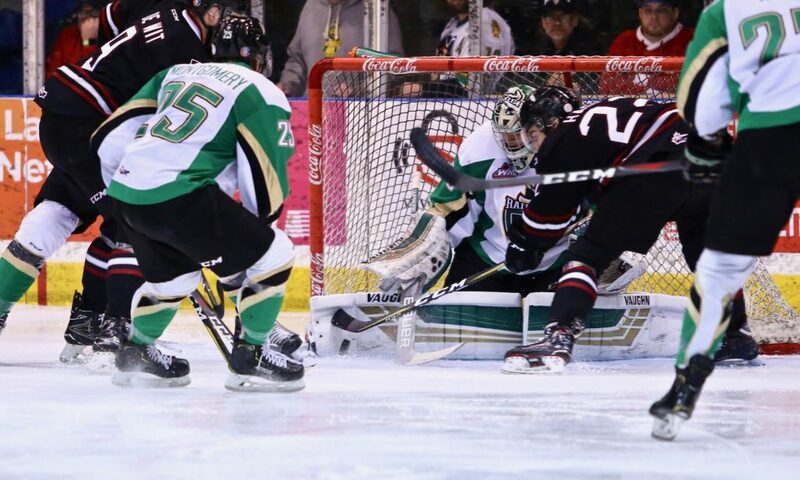 Dante Hannoun scored the only goal the Raiders needed in the final minute of the first period, barreling hard to the net and burying a corner pass from Aliaksei Protas. The hosts, for all intents and purposes, put the game away in the middle frame on goals from Ozzy Wiesblatt and Sean Montgomery. 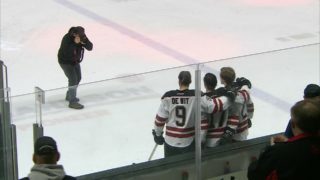 Wiesblatt converted a rebound following a point shot by Brayden Pachal and Montgomery, alone in front, ripped a wrist shot past Rebels netminder Ethan Anders after taking a corner feed from Justin Nachbaur. 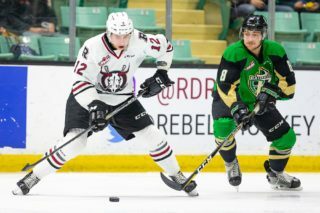 The Rebels generated nine shots in the second period and a handful of scoring chances, but couldn’t solve Raiders goaltender Ian Scott. Scott was equally as stingy in the third period, making a glorious glove stab on Brandon Hagel during a short-handed breakaway, one of seven shots he faced. The Rebels were strong defensively, in fact were rock-solid in that department in the final 20 minutes, surrendering just a single shot. “We were fine. I thought we did some pretty good things in that area,” said Sutter. In order to make life more difficult for Scott, the Rebels must create traffic in the low slot but that will prove to be a difficult task against an experienced and physical Prince Albert defensive corps. “They have some big defencemen but you have to outwork them,” said Sutter. The Rebels will have no other choice if they hope to pull out a victory in Game 2 Saturday. “If you want to win you have to score some goals,” said Sutter. Notable: Attendance was 3,093 . . . Scott turned aside 21 shots while Anders made 25 saves . . . 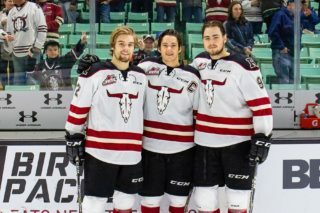 The Raiders swept the three-star selections, with Scott, Wiesblatt and defenceman Zach Hayes getting the honours . . . Games 3 and 4 will go Tuesday and Wednesday at the Centrium.